This collection of apocryphal texts supersedes the best-selling edition by M.R. James, which was originally published in 1924. 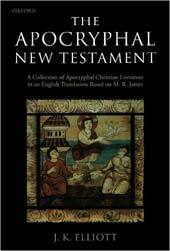 Several new texts have come to light since 1924 and the textual base for some of the apocrypha previously translated by James is now more secure, as in several cases there are now recently published critical editions available. Although a modest addition to James's edition was made in 1953, no thorough revision has previously been undertaken. In this volume, J.K. Elliott presents new translations of the texts and has provided each of them with a short introduction and bibliography for readers who wish to pursue further the issues raised in the texts or to consult the critical editions, other translations, or general studies. The translations are in modern English, in contrast to James's deliberate imitation of the language of the Authorized Version. The collection is designed to give readers the most important or famous of the Christian apocrypha and a small sample of gnostic texts. Full translations of the earliest texts are printed, as well as some derivative apocrypha.